We rented a fun loft we found on VRBO and stayed in Prague for about 10 days. 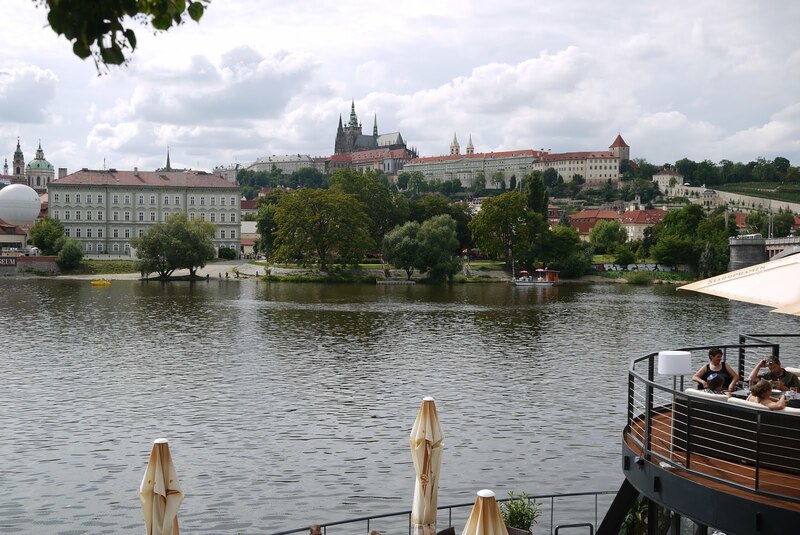 On the first day, we met up with our friends Rohit, Kaamna and their son Karam and went up to the Prague Castle together. We arrived about three hours before closing time. The ladies at the ticket counter warned us that we would not have enough time to go through everything and that we'd have to come back the next day. We thought they were crazy but they were right. The Castle is one of the biggest in the world and the complex includes a Cathedral, a monastery, several palaces, gardens and towers. But given that we were traveling with impatient one year old toddlers, we opted for the highlights. No detailed history guides here. In addition to touring the Castle complex, we walked around the Old Town, crossed the beautiful Charles bridge and explored Lesser town. Prague also has an interesting Jewish quarter that has Europe's oldest active synagogue. Amazingly it was not destroyed during WWII. Legend has it that the body of Golem lies in the attic of the synagogue and protected the building during the Nazi occupation. There was also a beautiful memorial hall in the Jewish quarter that lists the names of all of the Jews who died during the war. It was really sad to see all the names and especially poignant to see the years they were born and the years they all died, which was either 1942 or 1943. During our stay in Prague, we took a day trip to Kutna Hora, a town about 70km east of Prague. James went there several years before and told me about this interesting bone church (Sedlec Ossuary) in this town. Apparently it was a desirable burial place and after the plague, the cemetary had to be enlarged. The bodies were exhumed in the process and bones were stacked in heaps with no designated burial places. A woodcarver was finally commissioned to put the bones in order and he ended up making amazing objects with them - family coat of arms, a chandelier (which consist of at least one of every bone in the human body) and massive bone mounds. At the ossuary, we saw an American couple who looked very distinct dressed in mostly black leather. Turns out that they were Kat Von D and Nikki Sixx. James helped take a photo of them and Nikki Sixx took our family portrait. Sweet! We also visited the Church of Saint Barbara in Kutna Hora. It is a famous Gothic church that is also a UNESCO world heritage site. The flying buttresses were spectacular, though after visiting the church of bones moments earlier , this just couldn't top it. On days when we were not sightseeing, we hung out at home and only went out for food. Our go to place was this Asian vegan restaurant called Loving Hut. Neither of us are vegans, much less vegetarians, but we loved this place so much. When James asked if they are Buddhists, they responded that they are "The Truth". Turns out that they are a group who shares beliefs based on teachings from their Supreme Master Ching Hai, a woman who resides in California. Loving Hut is actually a global restaurant chain (and cult). If you are ever near the restaurant, try it, even if you are a meat lover. It will change your views, at least on vegan cuisine. We also tried traditional Czech food on several occasions. The portions were usually huge and everything was quite meaty. I tried the famous roast duck and James had the roasted pork knuckle. I gotta say, Czech food isn't my favorite but it does go well with beer. Our next stop was to Cesky Krumlov, a small city in the South of the Czech Republic. It is also one of James' favorite places in Europe!